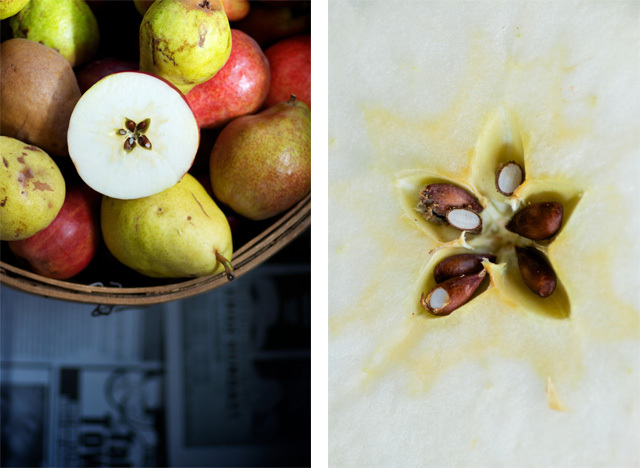 I love the fruits of autumn – pears and quince, yes, but it is the apples I love most of all. Indeed, eighty-five pounds of pomaceous fruit lurk in stacked cardboard boxes in my living room. They wait for me, quietly. And as they ripen, they release their gently scent – mildly floral and slightly spicy. Visitors notice it, too, as they work their way upstairs into our living room. It’s a lovely perfume, and one that only comes in autumn. We dry the fruit, and I make my son’s favorite skillet cake with apples and quince, but it’s this simple dish – homemade apple-pear sauce – that we love most of all. Recently, a friend and a remarkably skilled healer, asked about simple apple sauce on Nourished Kitchen’s facebook page (You have added the page to your favorites, yes? If you haven’t you’re really missing out), so it’s time I shared my favorite recipe. It isn’t elaborate, but then sometimes the simplest foods are the best. Indeed, this simple combination of apples, pears and juice is one of my son’s favorite dishes – provided it’s served warm. I like to cook with my son, and, as a homeschooling mother, I use the opportunity to educate him. We learn fractions as we measure one-quarter cup of this or two-thirds of that. But today, as I prepared his favorite apple sauce – the one that warms him on cold autumn days and that nurses him back to health when his belly is troubled, I took the opportunity to teach him about the star in the apple. You see, frugal-minded mother that I am, I always purchase number two fruit in bulk which reduces the price of apples and pears from $3 to $4 per pound down to $1.25 to $2. Sure, my apples are mottled or bruised. My pears have tough skin and ragged scars, but their flavor is lovely. 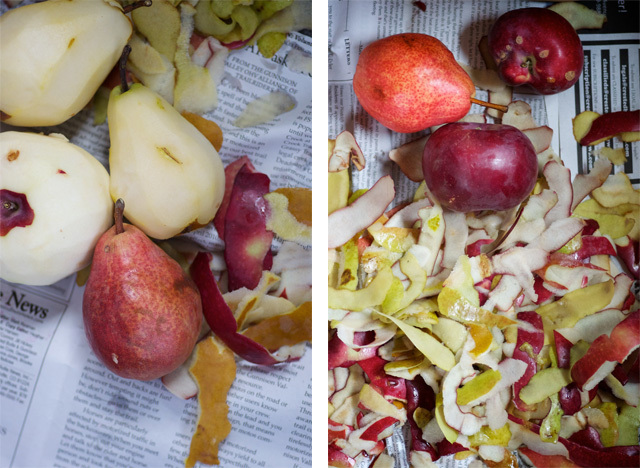 So as we peeled and chopped our way through pounds of apples and pears, I showed him how every apple, whether bruised, mottled or nearly perfect, bears a star at its core. And when I cut my apples, as wistful and sentimental as it seems, I cut them cross-wise to see the star at their centers. In this sauce, the natural sweetness of ripe apples and pears shines; however, I’m mindful of concentrated load of carbohydates present in the sauce as even natural sugars can pose a challenge to small children – or, at least, to my small child. So when I serve carbohydrate-rich foods like this sauce, I pair them with fat or protein which helps to reduce their glycemic load. After the apples and pears are gently stewed and pureed until the sauce is uniform, I stir in Indian dessert ghee – that is a a traditional ghee prepared from vitamin-rich, grass-fed butter and spiced with cardamom, fennel and saffron. While I occasionally make my own spiced ghees, I typically purchase them online (see sources) for their ease of use. I love the addition of fat-soluble vitamins provided by ghee which is naturally rich in vitamins A and K2, but more importantly, the infused spices provide a hint of complexity to an otherwise simple apple sauce. This simple apple-pear sauce is gentle on the palate and naturally sweet without added sugars. Toss peeled, cored and chopped apples and pears into a heavy-bottomed stock pot and cover with one and one-half quarts apple juice. Bring to a simmer over moderate heat. Cover and reduce the heat to medium-low, simmering gently until the apples and pears begin to fall apart on their own, about thirty minutes. 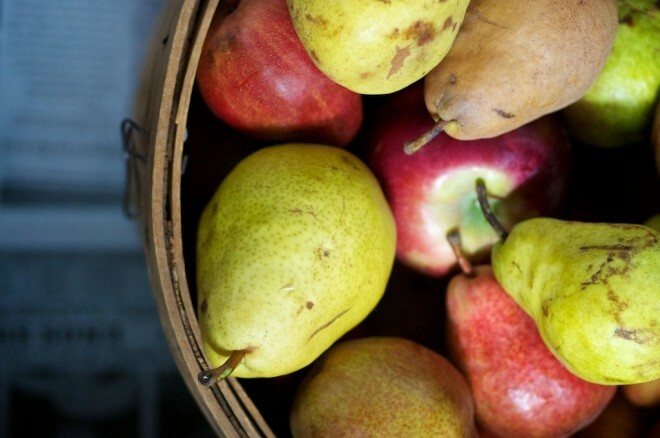 When the apples and pears are fall-apart tender, remove the pot from the heat and allow it to cool for about ten minutes. Puree with an immersion blender until the sauce is smooth and uniform in texture. Stir a spoonful of spiced ghee into each serving and serve warm. I was just wondering what to do with some pears and apples that will be ready soon. Is there a way of preserving this apple pear sauce? Could it be made into fruit roll-ups? If the ghee is added, will it interfere with the drying? Thank you for your site and great info. This is something I am definitely making. After it’s done, would I then be able to preserve it by jarring it and canning? I am new to that sector but want to learn! Any tips (or links) are appreciated! I never make a pear or applesauce without butter. the best!!!! Great recipe! I’m excited to try it. How do you purchase number two fruit in bulk? Thanks! Do you have a picture of what the Apple Pear Sauce looks like AFTER it’s finished? Thank you! Is it possible to make this in a slow cooker? If so would the apple juice be reduced? Thanks! I just core my apples and cook them down. After they are mush I put them through a China cap sieve/colander that comes with a wooden pin that pushes all the sauce out leaving only a bit of skin residue to discard. You get all the nutrients and less waste.